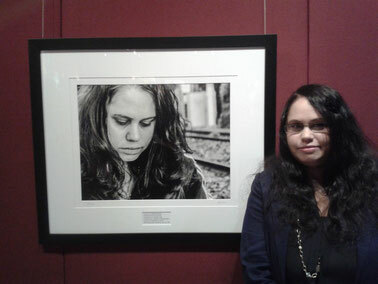 Cassandra Jones creates contemporary photographic artworks which often explore themes of Aboriginal identity. A descendant of the Gunai/Kurnai people in East Gippsland, Victoria, Cassandra is based in Sydney and is an emerging Aboriginal artist who held her first solo exhibition at Boomalli in 2016. Cassandra Jones was a finalist in the 2013 Parliament of NSW Aboriginal Art Prize for a collaborative work with Jannali Jones titled 'Sister'. Cassandra has exhibited at Boomalli in multiple exhibitions. Cassandra has also provided Graphic Design services for a number of state Aboriginal awards ceremonies including the Annual NSW Public Schools Nanga Mai Awards and TAFE NSW Gili Awards. In addition to Aboriginal contemporary art, Cassandra has an interest in and participates in street art and murals. She co-created Spilt Milk Magazine, an Arts and Culture Magazine, in 2015 and has been exhibited in a number of Street Art Group Exhibitions from 2010 such as Paste Modernism, Virtual Reality Viewer Exhibition, Spilt Milk Magazine Launch exhibition and Any Thing Goes.